volt home radios using separate "A"
Battery. Replaces Cat. No. 05160.
others. 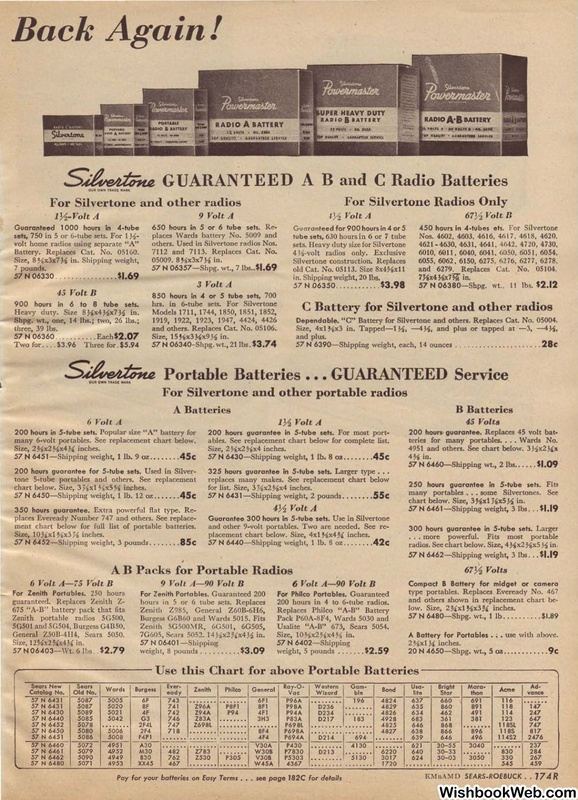 Used in Silvertone radios Nos. 7112 and 7113. Replaces Cat. No. in. Shipping weight, 20 lbs. Nos. 4602, 4603, 4616, 46l7, 4618, 4620. 6055, 6062, 6150, 6275, 6276, 6277, 6278.
and 6279. Replaces Cat. No. 05104. 900 hours in 6 to 8 tube sets. Heavy duty. Size 878x4V.x7V. in. and others. Replaces Cat. No. 05106. Dependable. "C" Battery for Silvertone and others. Replaces Cat. No. 05004.
many 6-volt portables. See replacement chart below. chart below. Size, 3Ysxl %x5 % inches. ment chart below for full list of portable batteries. Size, 10Ux1 %x3 Ys inches. ables. See replacement chart below for complete list. for list. Size, 3 Ysx2 %x4 inches. placement chart below. Size, 4x1 %x4%; inches. 7G605, Sears 5052. 14Ysx2Ux4Y. in. 200 hours in 4 to 6-tube radios. Usalite "A-B" 673, Sears 5054.
teries for many portables.•.• Wards No. chart below. Size, 3%x1%x5V. in. radios. See chart below. Size, 478x2%x5V. in. low. Size, 2%;x1 %x3%; inches. A Battery for Portables • ; • use with above.